Are you thinking about running a contest but feel intimidated by case studies, articles and reports which all seem to be offering thousands of dollars in trips to Tahiti, Rolexes or diamond rings? It’s actually one of the most frustrating things for Wishpond’s marketing team, as (time after time) we’re up against possible clients who don’t think social media contests are for them because they don’t have the budget to give away a car, boat, or all-inclusive vacation. But you’re wrong! You can find success with a smaller prize, so long as you promote intelligently and invest your time well. This article will show you five of Wishpond’s recent contests, all of which have prizes valued at less than $50, and all of which had huge success. Hopefully you’ll leave this article with a few prize ideas of your own, armed to boost social engagement and generate hundreds of qualified leads. This is my favorite example of a low-value prize intelligently marketed. If I hadn’t included a screenshot of the contest below, would you believe a pack of 20 varieties of plant seeds would drive almost 1,000 email addresses? This contest tapped into what the merchant’s target market was thinking about: spring, gardening, and beautiful flowers. They promoted heavily with email, social media and even Facebook ads, driving traffic to this simple landing page. I also like that there’s the lowest possible barrier of entry. Top Tip: It’s absolutely crucial that if you’re offering a prize of low value, you don’t ask your contest entrants to fill out much lead information. I recommend email address and first name only. This contest’s prize idea is actually a good one, as they’ve expanded their target market by promoting seeds, instead of a geranium, rose or rhododendron (you’ve just seen the extent of my plant knowledge). If they’d offered a large plant, people in apartments wouldn’t have entered. If they’d offered plants that only work in the tropics people in the north wouldn’t have engaged. What seems at first like a simple prize was actually a well thought out marketing strategy to maximize their ROI. Like the seed bank, Purdy’s chocolate ran their successful contest (which generated almost 400 email addresses) with a theme, this time based around Valentine’s Day. Of course, Valentine’s day is a big one for Purdy’s Chocolates, and this contest was only one part of their overall marketing promotion. Similarly to the seed bank, Purdy’s was smart in their prize (while keeping it affordable). I’ve recommended gift cards what seems like hundreds of times before, but this one really takes the cake (or chocolate, perhaps). Most B2C merchants will be better off offering a gift card than a product, as you ensure you don’t exclude anybody. 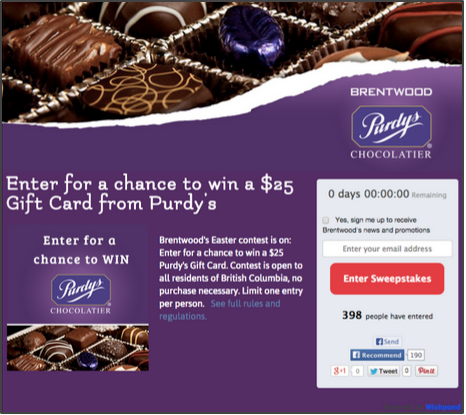 For instance, in this contest Purdy’s prize of a $25 gift card means they capture everybody who likes chocolate (a sizeable market). Otherwise, they would have excluded someone who likes nougat (if they’d offered only truffles), or someone who loves strawberry creams (if they’d offered only caramels). Hungry yet? Also, this contest has some great design elements. I recognize that not every business has Purdy’s design budget, but every little thing you can do to improve the look of your contest’s landing page will come back to you 10-fold down the line. Yes, you are seeing that number correctly. This contest garnered 5,650 leads for the merchant. Imagine if even 5% of those leads converted for a final sale down the line (worth, say $20), and imagine if they were on the Wishpond annual plan paying $45/month? Depending on what they spent in advertising, their ROI would have to be at least 5000%. Valued at less than $50, this contest’s prize is a niche one, and they promoted it in a niche way, targeting women between the age of 13 and 35 on Facebook with promoted posts and Facebook advertising. They knew their prize was only of value to a select group of individuals, so didn’t bother to target anybody else (this is a great way to avoid wasting your ad spend and marketing budget, by the way). Promotion to the side for this one, I’ll talk about the other cool elements of this contest. 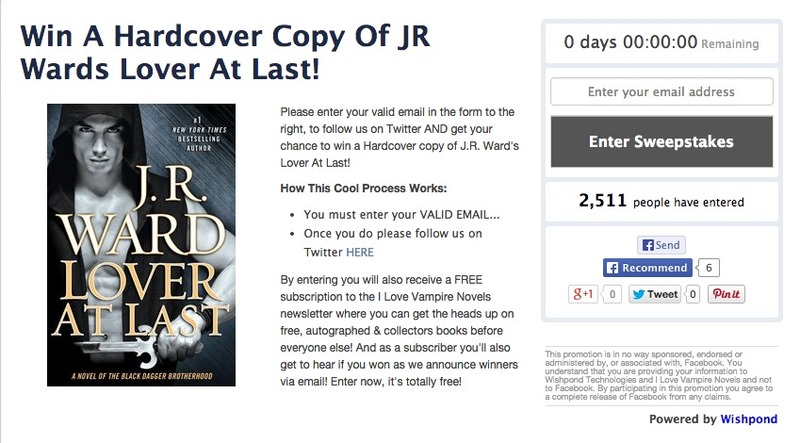 Firstly, they’ve used Wishpond’s simple contest landing page to its fullest. Their images, though simple, stand out and fit perfectly with the dimensions we recommend (I can’t tell you how many times I have to inform a client that, if they’d only shortened their secondary image on the left by 20 pixels their entire page would look 100% better). Secondly, I like the language they used, both in the headline and body copy of the contest landing page. “Enter to win” is a tried and true headline which tells people exactly what they need to do and what they need to do it for. 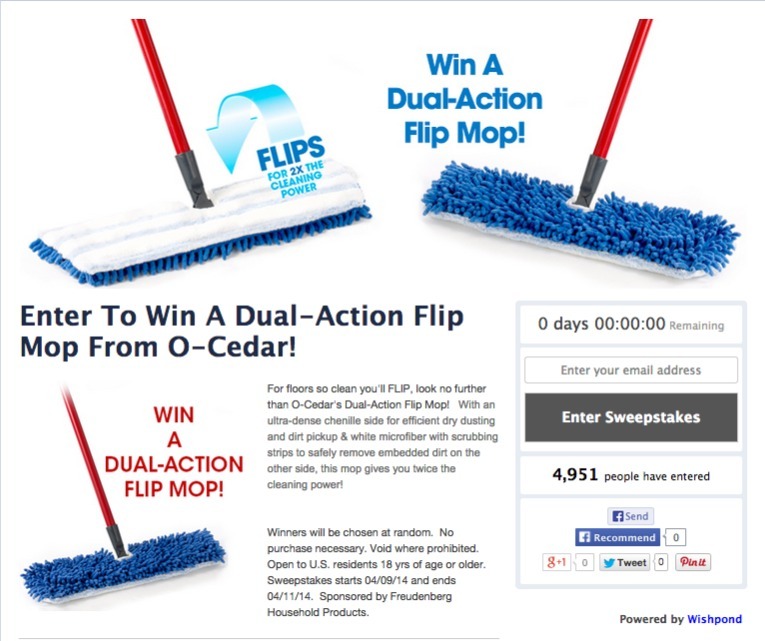 The first line of the body copy is fun and engaging: “For floors so clean you’ll FLIP!” and the rest is informative, specific, and (if I were interested in a dual-action mop) sells me fully. 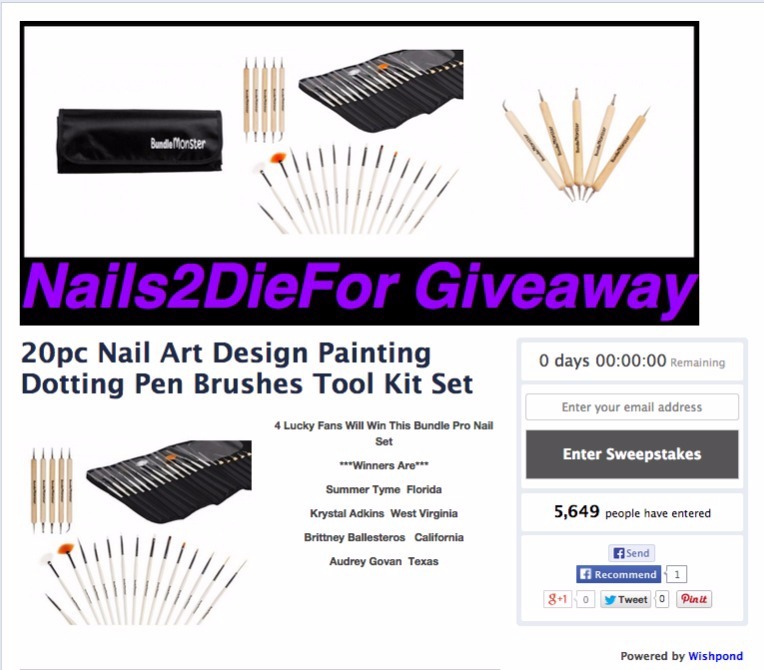 Again, this contest proves the rule of targeting your existing market to find success. In this case the merchant (a book publishing company) focused primarily on email marketing to promote. They had a sizeable segment of contacts who had purchased or engaged with this author’s work previously, so knew exactly who might be interested again. Many people think that online contests are only a way to drive new clients and social media Fans, but this isn’t the case (though it’s true). The fact of the matter is, contests are a great way to re-engage with your existing or previous clients. What better way to encourage loyal customers than to offer them something you know they’re interested in? Hopefully that’s given you a little confidence about running your own low-value contest. Imagine if you could get 5,650 leads from a prize valued at only $40! Heck, that’s worth a shot even if you get a couple hundred. These contest prize ideas are by no means fancy. In fact, they’re the opposite. But they are things that real people are really interested in. To be honest, if you were to offer a $2,500 Rolex you’d get a bunch of contest entrants (sure) but how valuable would they be to your business down the line? Unless you sell Rolexes, you just have a bunch of people who don’t actually care about your business. They’re just waiting for the next time you’re giving away something for free.